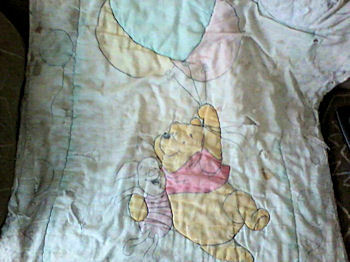 I am looking for a Winnie the Pooh crib blanket that was sold in 1999. My daughter’s that she sleeps with every night is falling apart, and she refuses to give it up. It has Winnie the Pooh and Piglet on it. 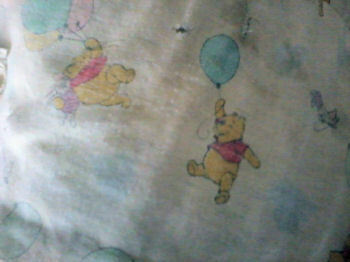 Winnie the Pooh is hanging on balloons that are yellow, pink, and either blue or green. There are 3 balloons. I would love any help you could provide. Same design different material/type of blanket. There is just like this on Ebay. I too need this exact blanket, i know this may be a late post but this has been my ONLY lead in finding this blanket. Any help is greatly appreciated. My son has this crib blanket still he was born in 1999. Not much left of it. I would love to find him a new one for christmas. No leads please help!